Aon, a solid core planet made of pure caladium, is under silent attack. The planet’s center is the hardest and most valuable element in the galaxy. Rogue officials, led by President Gaylen and in turn directed by off-worlder’s, set an 80-year plan in motion to seize Aon’s core. Off-worlders work to dissolve the unbreakable core using crude oil obtained from 19th century Earth. Once the oil is refined the by-product, gasoline will soften the caladium, allowing it to be collected. The off-worlders employ a band of corrupt inhabitants to carry out this work. The caladium core consists of living beings–these indestructible creatures prepare to defend their domain against the elements harvest. Separate alliances unwittingly come together in the dead city of Baine with Clay gravitating to leader. Their objective; preserve the planet. Disregarding all else, the crude oil thieves continue to process the pilfered caladium. Those who desire to save Aon will, along their path, face the core creatures, avoid horrific aberration’s one step behind, and dodge deadly pitfalls ahead. Once Clay melds the coalition, a battle for life and world begin. Wait a minute. Wrong story. Let me try again. In November of 2006, I was diagnosed with Multiple Sclerosis. Two months later, I was informed that my department at work was closing and I was soon to be among the unemployed. Fortunately, it would take the better part of a year to transition my department’s work load to the new vendor. Each spring, my son and I would take our annual fishing trip to Cape Hatteras. It was on one of these excursions that my son happened to mention that I should try writing after reading a few of my short stories. The thought intrigued me. So much, in fact, that I began penning short stories as soon as I returned from our trip. After several months of writing, I began what would become my first novel, Rising Tide. I completed the raw manuscript in September of 2008 with much help from my wife and son. They are both avid readers and were nearly as valuable as a good editor. After another six months of intense rewrites, edits and throwing errant objects against the wall, I finally had what I believed to be a completed manuscript. It was ready for the publisher and my adoring public, paving the way to fame and fortune. Little did I know that publishers don’t like to publish books. And if by chance they do happen to accept your manuscript, you’re thrown into a bin with a quarter of a million other authors who were published that year. By the grace of God, I found a publisher who would accept unsolicited manuscripts. After nine weeks, I received a contract and over the next year, completed my first novel. The next rude awakening was that the marketing of the book fell (almost) entirely on my shoulders. After making contact with thousands of newspapers, magazines, book clubs, book stores and any other entity I felt could sell my book, I’m still busy marketing after three years. Through this experience, I’ve met some of the nicest people that sincerely want to help advance sales of my book. But by the same token, I’ve run into a few that live thousands of miles away yet seem to despise me personally. For what reason, I cannot comprehend. Maybe they’re just very unhappy. I think I’ll say a prayer for them. The best advice I can give is to take rejection with a pulverized grain of salt. Keep writing even if it’s just one sentence a day. And never, ever give up. Looks like I don’t have to tie this post into writing. Since my last post asking my readers to help with a grass-roots campaign to market my book, several people have requested that I post a sample from the book itself. Your wish is my command….. I have taken two excerpts from two different chapters and created a “page” for viewing on this blog site. Notice at the top of this page a tab that says, “A Glimpse into Rising Tide.” Just click on that tab and you’ll be able to read the two excerpts provided. I hope you enjoy them. Good news folks! I just heard back about a writing contest I entered back in March of this year. I submitted Rising Tide on a whim, not sure of what to expect but hoping for the best. I’ve learned that’s how a solid 80% of a writer’s life operates (The other 20% is equal parts coffee and delusions of grandeur). I had forgotten about the contest, swept up as I was in the bright and shiny allure of authordom, which includes, as you very well know, hot tubs, sports cars and those delicious mini-quiches. So I was beyond surprised to find out that Rising Tide was chosen as a finalist in the 2112 National Indie Excellence Book Awards Contest. Pretty snazzy, huh? Now if you’ll excuse me, Jeeves is bringing the car around. This croquet match won’t play itself. For a full list of winners (including little ‘ole me) click here. Remember the days when all time pieces had faces with hands that moved in a circular motion (usually clockwise)? …Do you get as big a kick out of me as I get out of me? Probably not. And please know that was a rhetorical question. Then came the black squares with white numbers that flipped over (made famous in the movie Groundhog Day) as the time changed. If you listen closely early morning February 2, you can just hear Sonny tell Cher and visa versa “I got you babe.” Today most of us incorporate the red LED clocks in our bedrooms, bathrooms, spare guest rooms,and home offices throughout the house. The classic round tick tock is usually reserved for places of gathering and honor–the kitchen, living room, dining area–where they can be seen by friends and assorted house guests. True, they normally run on battery power but have the uncanny ability to accurately keep time and not flash twelve o’clock each time the power blinks. How do they know? Watches on the other hand, aside from a brief digital period have for the most part remained relativity unchanged…which is a good thing. Imagine having the disc on your wrist flashing red every time there’s a power outage. These different time pieces and ones I haven’t mentioned all have their place. Even though some are visually obsolete, they are still relevant time-keeping instruments. In the same vein of thought, there are some great new works of literature on the book shelves and some have even made it to the silver screen. By the same token the classics are alive and well. 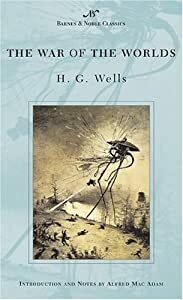 To prove my point using one example of many, H. G. Wells “War of the Worlds” (a novel past the century mark) was recently made into a movie for the second time. There are many more examples too numerous to mention but isn’t it nice to know that in this world of built-in obsolescence that some things are timeless? Now if my watch would only flash red, maybe I could find it. There, I said it. I violated the most sacred law of the written word since…well, the first word was written. And what was my intolerable transgression? I judged a book by its cover. Pun intended, no pun intended, it doesn’t matter because it’s not funny anyway. And no lawsuits, please. If you think about it, you’ve most certainly violated this unwritten rule yourself, whether in life’s daily pitfalls or literally, when choosing a book. I made the mistake of choosing a novel way beyond my years for a book report while in elementary school. It had a really neat cover (speaking in period lingo) and it was about three inches thick, which I thought made me look right groovy. (period lingo once again) While my classmates chose thin little kiddie books, I compared my adult novel to their simplistic choices. I imagined standing in front of the class as an adult having read such advanced literature and the exquisite book report it would impart. Imagine the hissing sound heard round the classroom as my ego deflated when it came time to read “Ivanhoe.” I immediately formed a battle strategy… Procrastinate. Slowly at first and then in a bloody massacre, my soldiers began to fall until a week before my book report was due, I still had five hundred pages of a five hundred page novel to read. What to do, what to do? Then one day while perusing the assorted reading material the teacher kept on a table at the back of the class, I saw it…THE LIGHT AT THE END OF THE TUNNEL….the oasis in the blistering heat of the desert…the Calvary in the nick of time. 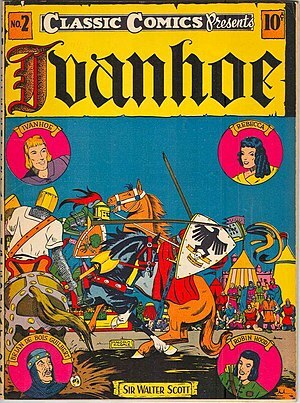 There it sat, “Ivanhoe,” the comic book! (or, in today’s vernacular “graphic novel.”) I had been pulled from the jaws of utter failure and into the light of the elusive “A” on my oral book report through no contribution of my own. So you see, occasionally judging a book by its cover can return a significant reward….but usually not. In my case, it was still a bone-headed move….hmm, guess I’ve acquired all the credentials I need to go into politics? Ever had a “Huckleberry Finn” experience? I mean an “everybody get together throw down and paint your fence”…wait a minute, that was Tom Sawyer. All right, I’ve got it… Remember when the town rallied to rescue Huck from the cave?…No! No! No! That was Becky Thatcher. It musta been the coyote ridin that ACME rocket…you know…he was about to catch the roadrunner… naw, that’s not it either. I grew up near the Chickahominy River Recreational Complex and Amusement Park or C.R.A.P. for short…Sorry, but I just couldn’t resist and believe it or not I didn’t plan that acronym. 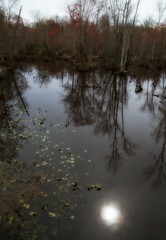 Actually I grew up almost smack dab in the middle of the Chickahominy River basin. For me it was a huge source of entertainment, with its ponds, marshes, canals, pastures, wooded areas, creeks–you name it and it had it as far as outdoor recreation goes. From about the age of twelve I fished, hunted, caught frogs, snakes, salamanders, snapping turtles, and probably did numerous things my parents would have had a fit had they known. Not illegal things but stupid things like climbing to the top of a sapling and swinging down to the ground or swimming with copperheads… Just your normal, average, everyday, young teenager behavior, right? Take three fifty-five gallon drums, two by two’s to hold them together, a sheet of plywood for a deck with assorted pipes, and pieces of plywood for custom-made swivel seats, and wadda-ya know, a genuine swamp-worthy raft. There was only one minor problem…how to haul an awkward, two-hundred plus pound behemoth the better part of a mile and carry it over anything but level terrain. This was a veritable torture course of hills, twice as far up as they were down. Woods, creeks, ditches, barbed wire fences, fields with grass more than four feet tall and there may have been a volcano and a dragon or two (I can’t recall the entire treacherous journey). Several hours, and more than a few unwholesome words later, we were ready for our maiden voyage. Now, you have to use your imagination and picture this–two skinny young teenagers pushing this conglomeration into the water. Hold your breath…Drum roll…It floats perfectly! All aboard! Before we shoot the rapids let me tell you that this thing was about as stable as a schizophrenic crack-head jonesing for morphine. Not only could we not stand on it; we couldn’t sit, lay or even look at it without being thrown off. I imagine two otters trying to balance on a wet, greasy, beach-ball. After the addition of a fourth barrel and some judicious carpentry, we had a raft Huck and Jim both would have been proud of. We had a great time using the raft to float felled trees to a secluded area to build a log cabin, which never came to fruition. The swamp was ours to exploit, and we did until such time in a young man’s life when his priorities turn to what is perceived to be more mature undertakings, namely cars and girls, but is now known to merely be hormone upheaval. That was a great part of my childhood. I think back on it fondly; in fact, years later I actually built a log cabin less than a mile from where we used to fish. I lived in it for seven years before moving out of the area. Ya know, this isn’t such a bad story…maybe I’ll take time and write it down someday….ah…I don’t know.